Add life to your courses and engage learners with illustrated and photographic characters. Characters have a variety of hairstyles, clothing, poses, and expressions. 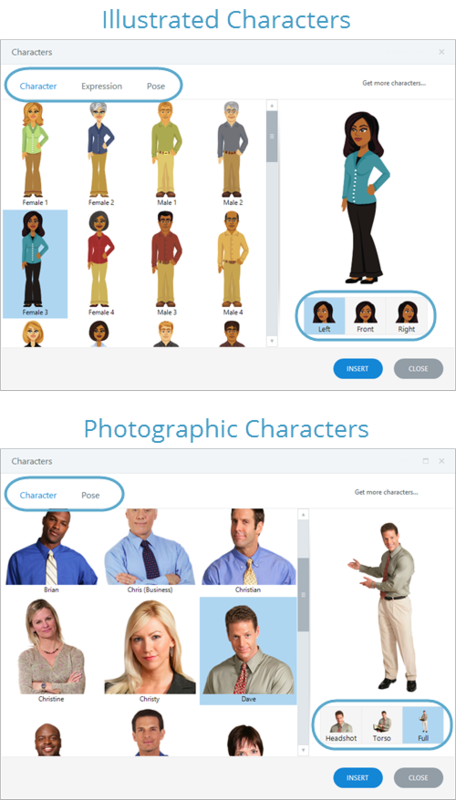 Articulate Storyline comes with a library of illustrated characters and one photographic character. You can purchase more characters in the Articulate Store. Go to the Insert tab on the ribbon, click Character, and choose Illustrated or Photographic. When the character window appears, use the buttons at the top and the lower right of the window to customize your character. If you're inserting an illustrated character, choose the character, expression, pose, and perspective. If you're inserting a photographic character, choose the character, pose, and crop. As you make selections, the character preview pane on the right side of the window updates to reflect your choices. Click Insert to add your character to the current slide. Characters behave like other images. You can move, resize, crop, format, and animate them. You can even add states to characters to show different expressions and poses, then use triggers to switch between those states.